The Test captaincy of England is not like the Test captaincy of Sri Lanka. On the smaller island, the captaincy is a vexed and volatile thing, thrust upon you on Monday, snatched from your grasp the next week, with a raucous win, a haunting defeat, a disciplinary suspension and a furious war with the board in between. When a new captain is appointed, you may not know whether they will be very good, but you can be damn sure it will end in intense frustration. For a few years, Mahela Jayawardene and Kumar Sangakkara had traded the captaincy back and forth like it was a grenade with the pin removed. The England captaincy, meanwhile, is much longed for. Notwithstanding unspeakable cricketing horrors like a career-ending injury, or having Kevin Pietersen for a team-mate, it is a fairly stable job. It is also cherished. An institution, almost. England captains write books that people still want to read (no matter how boring), pen letters to travelling fans when their accommodation has been bungled, and in general are the face of the sport in the country. Even Alastair Cook, who if we’re honest, has less charisma than some of the more aggressive strains of bacteria, held the job for over four years. Yet with the stability and prestige also comes intense, relentless scrutiny – the likes of which many other captains around the world rarely experience. Strategies are rapidly discussed on Twitter. Stretches of poor form are remarked upon in an array of newspaper columns and television studios, sometimes before they even have a chance to happen. Minutiae is picked apart on a grand scale. “Did the captain have too few close catchers? Did he bring his third seamer on an over too late? Poor body language in the huddle, wasn’t it? And he looks dehydrated – poor water consumption technique in the drinks break.” Then a hydration expert comes into the studio and they air a graphics-led piece on how the players’ lips are not at optimal openness, and people frown, and murmur, and shake their heads at how an England captain – a man who’s been drinking water all his life – could possibly be so daft. All of which is to say, that when Joe Root makes it clear that England are changing the way they play Test cricket, it is no small thing. Transformation of a team’s approach happens on a series-by-series basis in some corners of the planet, but in England, with all its history and its prestige and the electron-microscope level analysis taken into the reckoning, it feels like an almighty upending of tradition; a tearing-down of a monolith. This is doubly true when the brand of cricket you are proposing is built around aggression. Of all Test cricket’s vaunted virtues, patience and discipline are the most stereotypically English. This is the nation that produced Botham, yes, but also Boycott, and Tavare, and Atherton, Hussain and Cook. And here comes Root preaching doctrines like “score your runs before the good ball gets you out”, and “attack the spinners off their lengths”. That he’s insisting on staying at No. 4, where he has a record of being more effective, rather than going up to fill the vacancy at No. 3 in a typical set-the-example-lead-from-the-front English captain way, grates with some. There are times on this tour when the Root doctrine has genuinely seemed nuts. In Galle on the first morning of the series, England were 103 for 5, in serious danger of being crushed like South Africa had been at the same venue, a few months prior. During that period, Root had charged Rangana Herath, yorked himself, and was bowled by an unremarkable delivery. In that match, it was also two patient innings – those of Keaton Jennings and Ben Foakes – that had been the backbone of England’s totals. Many teams would have taken note, thought it through, changed tack for the second Test. And yet there England were in Pallekele, sometimes flat-out refusing to defend, driving, cutting, and most of all, sweeping. Led by Root, they played as men obsessed with the shot, and the runs it brought them. At times it was like the sweep and reverse were the only shots they knew how to play. If the ICC decided to ban the sweep and its variants before the next Test, England’s batsmen would be so lost, they might try to headbutt the ball, or thrust pelvises at it. Root’s own innings was a microcosm of the journey he has asked his team to travel. The first ten minutes was hair-raising – plays-and-misses here, edges falling into empty space there, spirited lbw appeals almost every over. The England captain was playing aggressively but struggling, with a match on the line, a difficult pitch underfoot, a horde of expectant fans in the stands, and every reason to back down and revert to caution. Then he got down on his knees, and swept. Then he swept again. Through the course of the day, there were full-blooded mows to cow corner, a thumping six down the ground, flat reverse sweeps, full-blooded cuts, and a near-catch at deep midwicket that did nothing to inspire an iota of reticence in Root. 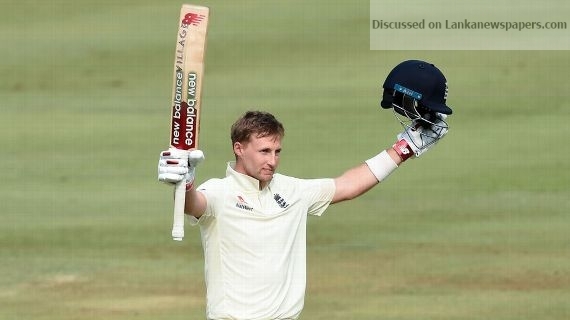 Having watched Jack Leach, Keaton Jennings, Rory Burns and Ben Stokes all perish attempting the sweep in the first session, Root doubled down on aggression in the afternoon, hitting 72 off 82 balls in the middle session, putting the ball into gaps and travelling between the two ends like a pinball. The transformation is not merely for the team, it is for the neutral spectator as well. After generations of occasionally effective, but routinely sullen English cricket, Root’s England is actually a little fun.